Minka-Aire is a key part of Minka-Group and has over 2,100 independent lighting showroom dealers and national accounts. Minka-Aire works to produce quality products for all prices ranges, and has expertise working with multiple materials such as wood and wrought iron. According to D&B Hoovers, the Minka Group has over 500 patents for different fixtures, and are constantly bringing innovation and new style. The following information should guide you in learning about Minka-Aire, their newest product introductions, best sellers, and more. 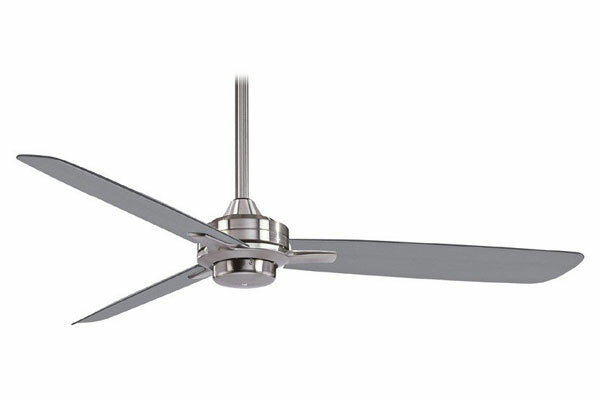 Why Buy Minka-Aire Ceiling Fans? 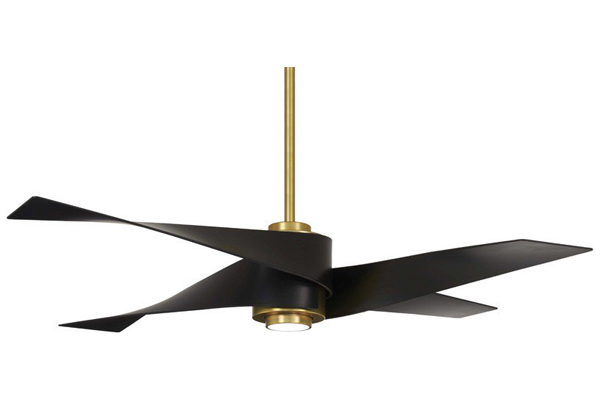 Minka-Aire ceiling fans are not only contemporary but timeless. With a variety of styles and designs to choose from, Minka-Aire ceiling fans are noteworthy not only for their looks, but for their value. 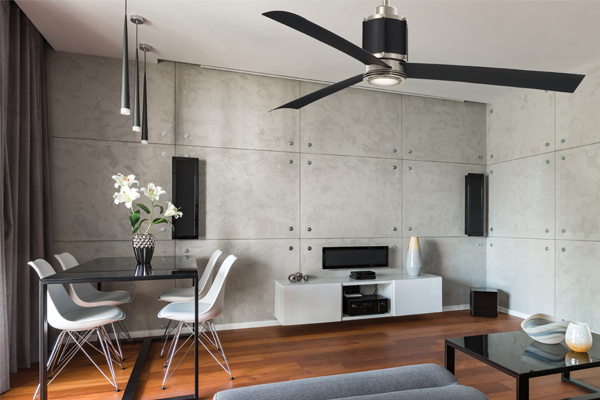 Minka-Aire ceiling fans circulate air efficiently and reduce cooling costs up to 40% in the summer, and can reduce heating costs by up to 15% in the winter. 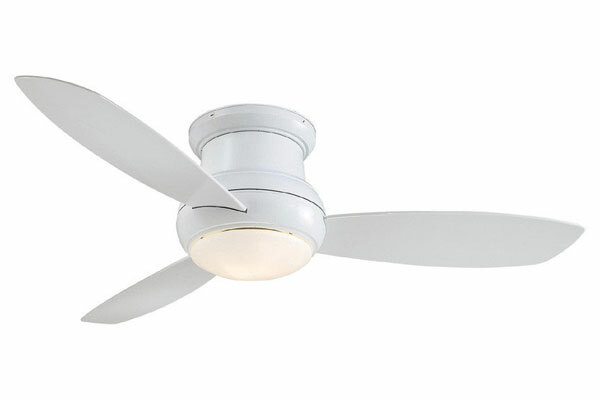 While correct blade rotation during the different seasons helps with this, efficient ceiling fans such as Minka-Aire ceiling fans make a significant difference. 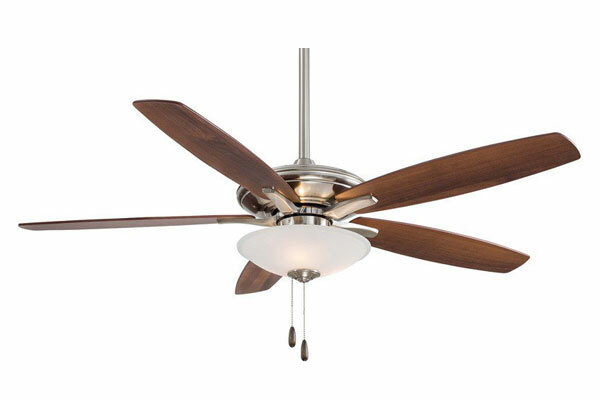 Many of Minka-Aire’s ceiling fans are Energy Star Certified. Minka-Aire brings form, function, and innovation into a beautiful package. The Simple is a fitting name for this clean and modern piece of technology. The Simple can be installed in either indoor or outdoor locations and features a DC motor. The three silver blades feature a 14-degree blade pitch, a 44-inch blade span, and create a CFM average of 3,572. This sleek beauty comes with a six-speed remote control and reverse function. The Simple is also available in a 52-inch blade span and an oil-rubbed finished silver finish, or a flat white finish. The featured Simple above is boasting a beautiful brushed nickel wet finish. Light Kit Compatible: The Simple is light kit compatible, meaning that an LED downlight can be purchased separately. With or without lighting, the Simple is a piece of form and function. A blend of modern and industrial design, the Triple is equipped with a DC motor and a dimmable LED downlight. The Triple is named for its three turbine-like blades which span 60 inches and produce a 4,089 average CFM rating. The Triple comes with a reverse function, six-speed remote control, and is available in four different finishes. This Triple is also shown in a brushed nickel finish. Showing off in a distressed koa finish, the Swept is also available in a kocoa finish, silver finish, and a flat white finish. This transitional fixture showcases four variable pitch blades, a 4,108 average CFM rating, and an integrated dimmable LED light. The Swept’s blades span 56 inches and have a 14-degree blade pitch. 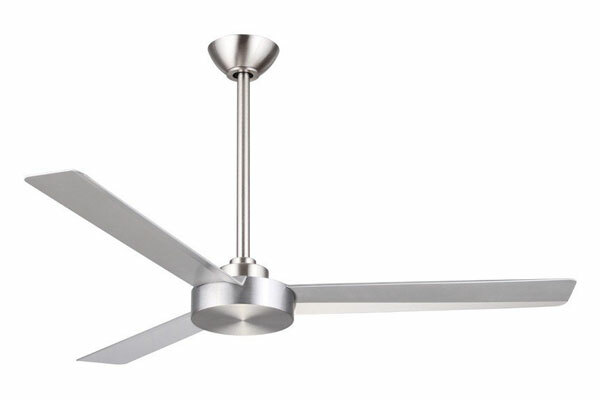 This gorgeous ceiling fan also comes with a six-speed remote control and reverse function. In a soft brass, with four matte black blades, the Artemis IV comes with a reverse function and six-speed remote. This gem can also be complete with a gunmetal finish, brushed nickel finish, or oil rubbed bronze finish. The Artemis IV hangs about 16 inches from the ceiling and has a dimmable LED downlight. 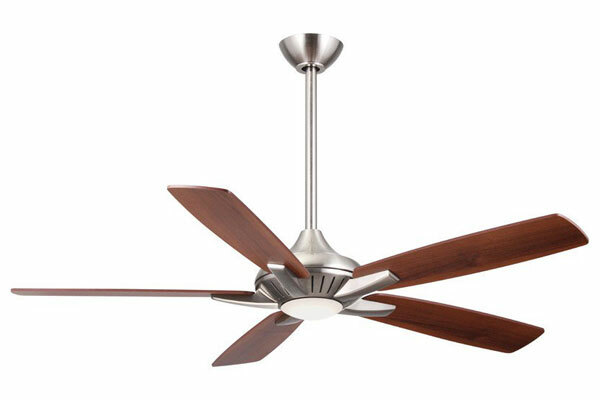 The curves on this indoor ceiling fan not only speak to its uniqueness but produce an average CFM rating of 4,183. This is expected to be popular as it follows several of 2018’s lighting trends. Cap for non-use light: The Artemis IV also comes with a cap which can be placed over the LED if desired. With sharp, bold lines, and industrial appeal, the Gear draws attention no matter which indoor location it is placed in. This three-bladed delight also features a dimmable LED light, reverse function, and six-speed remote control. The blades span 54 inches and produce an average CFM of 4,953. The Gear pictured above is in a brushed steel with matte black blades but is also available in three other finishes. Why Buy Minka-Aire from Del Mar Fans and Lighting? Del Mar Fans & Lighting is a family-owned business with an American Lighting Association certified staff and a mission to provide you with quality products at low prices, excellent customer service, and expert advice. We are an authorized distributor of Minka-Aire ceiling fans and remain in constant contact with our Minka-Aire sales representative to ensure our customers have the best Minka-Aire shopping experience with us. 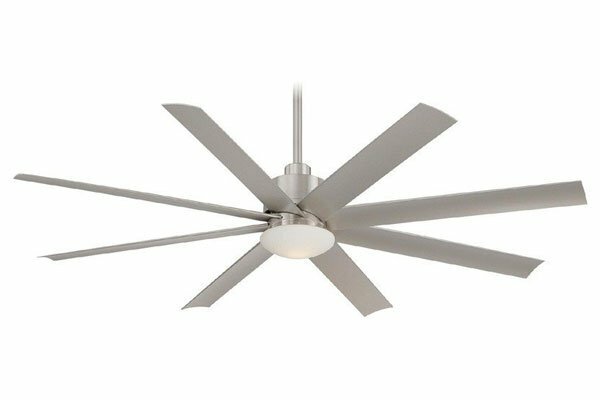 We have been an authorized distributor of Minka-Aire ceiling fans for over twelve years and have filmed several Minka-Aire ceiling fan installation guides to help our customers. Not only do we offer expedited shipping, but all orders over $40 ship for free. The Slipstream is all about sleek styling and making a statement. 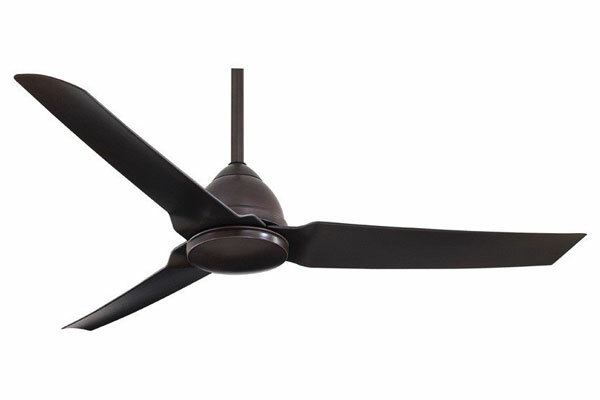 The Slipstream has eight all-weather ceiling fan blades and can be placed in wet, damp, or dry locations. Not only is the Slipstream Energy Star Certified, but it produces a high CFM rating of 8,778. This whopper is available in four different finishes but is shown with the ever-popular brushed nickel wet finish. Cap for non-use light: The Slipstream also comes with a cap which can be placed over the fluorescent lighting if desired. With three all-weather blades and a fabulous contemporary style, the Java with a kocoa finish could be easily incorporated into your sunroom, living room, patio, or any location that speaks to your style. The Java comes with a three-speed handheld remote, availability in four different finishes, and a reverse function on the motor. Java LED: The Java LED is a sister product to the Java. If you are interested in the Java but lighting is a desired feature, the Java LED has all of the same features of the Java but includes a dimmable LED light. 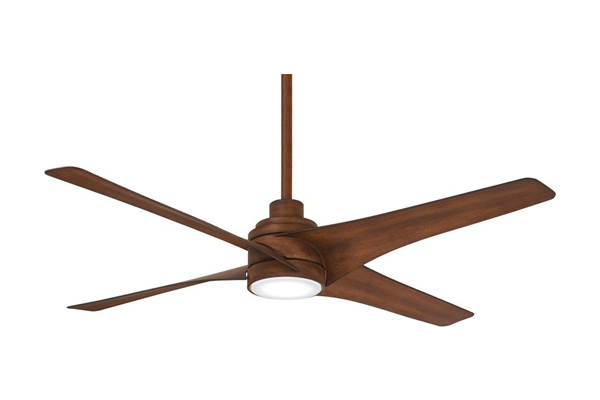 The Light Wave in a distressed koa finish is a very popular contemporary ceiling fan. The Light Wave comes with a three-speed remote control, an integrated LED which is dimmable, and a reverse function switch on the motor. 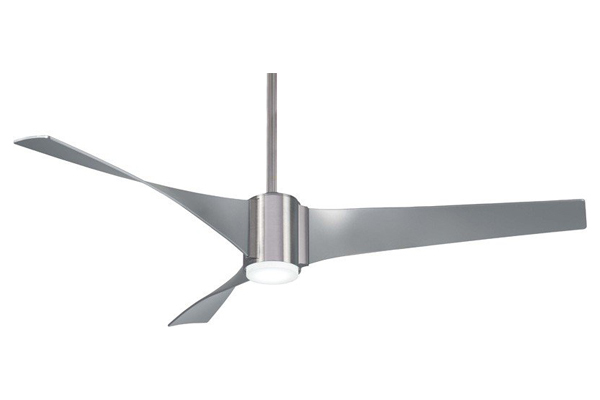 This innovate fan has beautifully curved blades, and can also be ordered in a silver or white finish. Wave: The Wave is the sister to the Light Wave and is the non-lighted model for those desiring a ceiling fan without lights. Wave II: The Wave II is another sister product of the light wave. The Wave II is very unique and offers a fun twist as it features only two blades. 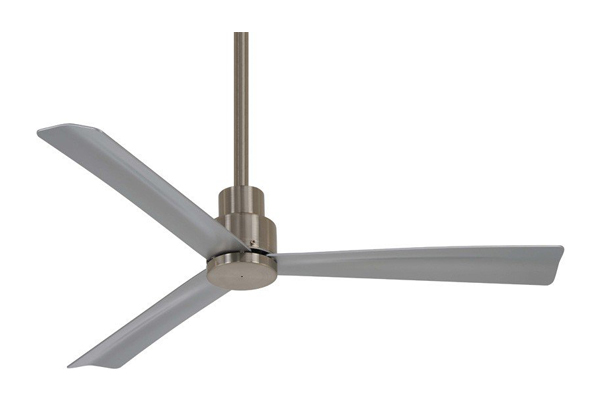 Perfect for smaller, or space limited rooms, the Concept II Flush is a flush mounted ceiling fan which requires 75% less assembly time. It features a 14-watt dimmable LED and a white opal glass shade at the center of its three 52-inch blades. This Concept II Flush is finished with a white but is available in four additional finishes including a lovely oil-rubbed bronze finish. Cap for non-use light: The Concept II Flush also comes with a cap which can be placed over the LED lighting if desired, along with a three-speed remote control, and reverse function. Concept II Wet: The Concept II Wet also comes with an integrated LED and a cap for non-use light, however, Concept II Wet is the perfect fit if you are looking to place this in a Wet or Damp location. The Artemis XL5 is a beautiful model with a 62-inch blade span and five polycarbonate blades of a distressed koa finish. The Artemis XL5 is available in three other finishes and comes with a dimmable LED, a six-speed remote control, and a reverse function. A particularly noteworthy and interesting finish is the liquid nickel which looks like it has marbling of black, white, and greys across its blades. The Artemis XL5 has a very distinct profile and is certainly very unique. Cap for non-use light: The Artemis XL5 also comes with a cap which can be placed over the LED lighting if desired, along with a three-speed remote control, and reverse function. Artemis: The Artemis is the little sister to the Artemis XL5. Not only is the Artemis slightly smaller with a 58-inch blade span, but it is also available in ten different, and unique, finishes, and features only three blades. The Artemis additionally won the “Good Design Award” Chicago Athenaeum’s Museum of Architecture and Design back in 2005. Both models are distinct and unique. Available in five different finishes, the Mojo brings transitional style and is shown in brushed nickel in the picture above. The Mojo has five warp resistant blades with a 12-degree pitch. This ceiling fan has three speeds and is controlled via pull chain. Additionally, there is a reverse on the motor. Cap for non-use light: The Mojo comes with a cap which can be placed over the lighting if desired. Mojo II: A great option for lower ceilings, the Mojo II is a newer addition to the collection which is designed to be flush mounted. The Mojo II features four blades, lighting shaded by the frosted white glass, and is also available in five different finishes. The Roto is the perfect marriage between contemporary design and a sleek, industrial style. The Roto has a 52-inch blade span and 22-degree pitch with is three blades which produce a high CFM of 5,816. 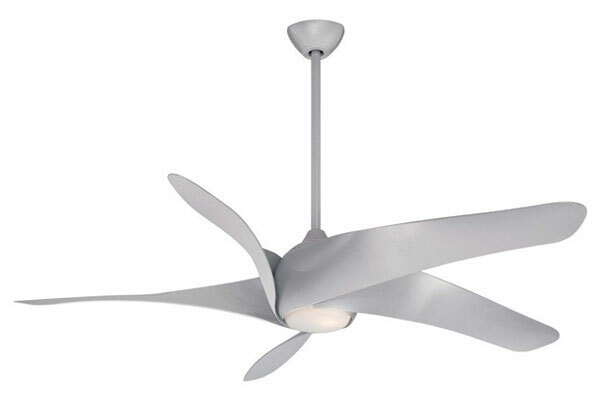 This modern marvel is shown in the brushed aluminum finish has a four-speed wall control and only hangs about nine and a half inches from the ceiling. The Roto is available in four different finishes. Roto XL: For a larger, outdoor model of the Roto comes the Roto XL. The three blades on the Roto XL span 62 inches and have a slight fold construction which produces a high CFM rating of 7,577. The Roto XL is ETL listed for wet locations. The Dyno was released as the first model within the Value collection to feature an integrated LED light source. The Dyno has a 52-inch blade span and comes with a three-speed remote control. 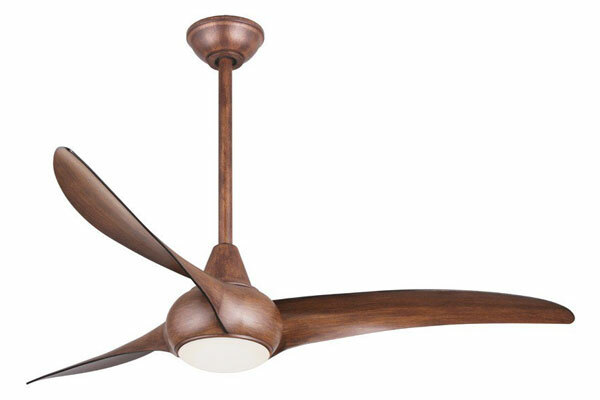 This ceiling fan can be installed on sloped ceilings which have a slope up to 21 degrees. The Dyno, pictured above, features five dark walnut blades which are reversible to a medium maple plywood. Both sides of the Dynos blades are a warm and welcoming touch. As its name suggests, the Aviation LED was designed to meet the image of vintage airplane propellers. 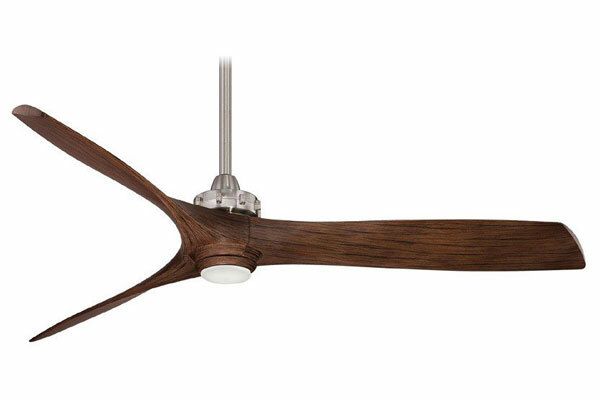 This contemporary airplane ceiling fan is elegant and innovative and features a 15-watt dimmable LED. The Aviation LED is available in an ash maple finish, distressed koa finish, medium maple finish, silver finish, and a white finish. This model also runs on a DC motor and can standard on angle mounted on sloped ceilings up to 18 degrees. Aviation: Also available in five different finishes comes the non-lighted model of the Aviation LED- the Aviation. The Aviation has a high CFM rating of 6,604 and is Energy Star Certified. While the Rudolph doesn’t boast a bright red nose, the Rudolph does highlight a clean and contemporary design and simple style. The Rudolph was inspired by a contemporary architect of the 1950’s and embraces current trends from today, such as its three-blade design. The Rudolph is available in four different finish options, and this Rudolph is shown with a brushed nickel downrod and motor housing, and silver blades. The Bond is an exciting newer piece of technology which allows you to control your ceiling fan from any location using your smart device, Amazon Echo, or Google Home. . The Bond can schedule and control up to six different fans and lights, or appliances that use remote controls. 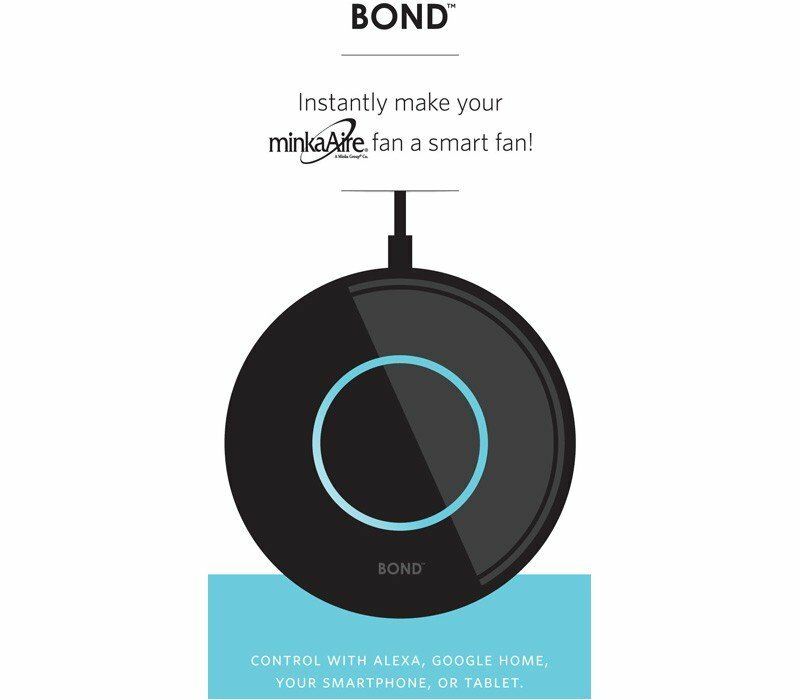 The Bond is currently compatible with 286 Minka-Aire ceiling fans, nine Minka-Aire remotes, and three Minka-Aire DC wall controls. For information on whether or not your ceiling fan is Bond compatible, our ceiling fan experts are always reachable at 1-800-724-5501. 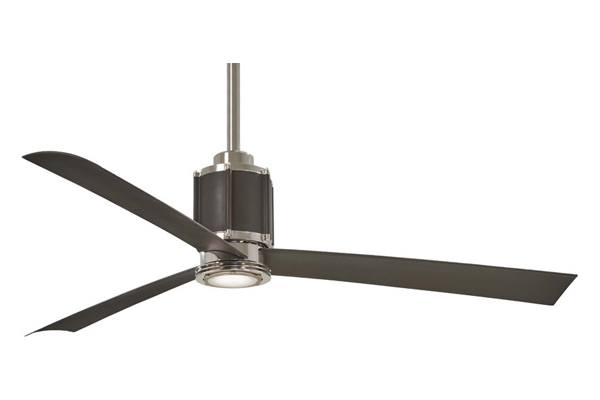 What is your favorite Minka-Aire ceiling fan? Let us know in the comments below!